The politics will not be discussed here, but we all know that there are some. As of the evening of 16 October 2013, the government shutdown ended, but the story is still unfolding and the impact on this summer's science is still not fully known. Here's one of the USAP restart announcements. So what does that mean? "It's complicated," to quote a phrase often seen on Facebook. The best summary quotation I've seen came from an ice person the day after the shutdown ended: "The NSF has to make decisions on what science can be done in conjunction with what support can be provided. Science cargo is not on the Ice. Logistical prep work that normally takes a month for us to do has not been done. Big decisions need to be made and it will take more than a week to arrive at some good decisions." The above USAP announcement included the statement that plans would continue for the fuel and cargo resupply vessels as well as the icebreaker. The impact on Pole projects was expected to be relatively minor--in part because the station was still in "winter" science mode despite the first passenger flight of the season at the beginning of October. Albrecht Karle, an associate director of IceCube, announced that efforts were underway to restore their original season plans as much as possible. Some other coverage--this 17 October Nature news article "US government scientists head back to work", and another article "Politics: The long shadow of the shutdown" published the next day. Also on 18 October, a NPR "Here and Now" story "Government Shutdown Disrupts Scientists' Work in Antarctica" (audio and transcript), and an 18 October Science Friday report (audio) featuring J. Marshall Shepherd, president of the American Meteorological Society, and Sridhar Anandakrishnan, a Penn State glaciology researcher most recently a co-PI involved with the Pine Island Glacier studies. Two NSF letters--this 17 October notice to universities/colleges/other grantee organizations from acting NSF director Cora Marrett, and an 18 October "Dear Colleague" letter from Antarctic section head Scott Borg. This archived 18 October Discovery News article further discusses the NSF scramble...some of the LDB projects could be cancelled, but NASA's Operation IceBridge, scheduled to operate from McMurdo, will go ahead, albeit with fewer flights. The LMG 17 October departure from Palmer Station was delayed for a day to give time for all of science folks and their cargo to finally get moved to the station. Here's a news item from ScienceInsider and a 17 October blog post by LTER researcher Jamie Collins from the MIT/WHOI Joint Program (also check out his other recent blog posts). A friend told me that the main drilling component of the WISSARD project was cancelled for this season. This 20 October ScienceInsider article describes the cancellation of another major McM-based field project--Moss Landing researcher Stacy Kim's undersea (diving and ROV's) project studying the top predators--Adelie penguins, minke and killer whales--and their prey. On 28 September, NSF issued a press release on the effects of the shutdown and the efforts to restore as much of the summer science season as possible. 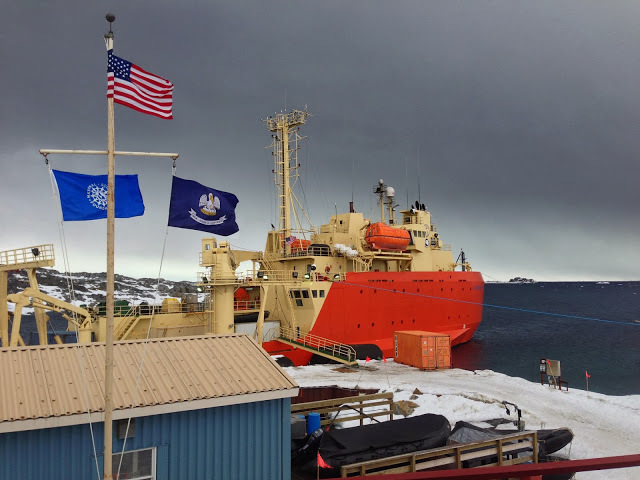 While the effects on Pole and Palmer science were expected to be minor, 13 of the 77 McMurdo-area science projects had been deferred, 15 others were still being evaluated, and some of the deploying projects have scope reductions or modifications. On 1 October 2013 Congress had not passed the required continuing resolution to fund government operations. This was due in large part to disagreements about certain aspects of the Affordable Care Act, much of which was scheduled to be implemented beginning 1 October (see this Wikipedia article for more of those details). So, things started shutting down. NSF's initial response on that date was that activities would continue for the moment, with commitment to protect the safety of deployed personnel in the Arctic and Antarctic (see the 1 October portion of this since-updated NSF announcement). At the same time, NSF sent this notice to universities and other nonprofit institutions. The first public inkling of this appeared in this 4 October Nature news article, which quoted a Lockheed-Martin spokesperson who said that "a decision will be made early next week." Speculation continued on Monday 7 October, perhaps best summarized in this NPR report by science reporter Nell Greenfieldboyce. And the next day, all speculation was laid to rest, as NSF made the official announcement that the program was moving to implement caretaker status. Here's an archive of the official 8 October announcement. While this announcement included the statement that NSF "...will also develop the information needed to restore the 2013-14 austral summer research program to the maximum extent possible, once an appropriation materializes." But some of the decisions are irreversible. Here is another 8 October report from the AAAS ScienceInsider. The impact on Palmer Station was the easiest to analyze, as the station is the smallest and the logistics are simple. The Laurence M. Gould arrived on 8 October, bringing with it a major resupply of food and fuel, as well as the majority of scientists for the 2013-14 summer season. But as soon as the LMG arrived, the scientists were told to remain on board; their equipment was not being offloaded. Instead, some of the science equipment already on station was being loaded for the trip north. The graduate students working on masters' or PhD degree projects are out of luck. The vessel was scheduled to take all of them north on 17 October, leaving behind a "caretaker" staff of 11 for perhaps the next five months. But it did not leave. Some Palmer-specific news coverage includes these two reports about just-arrived LTER scientists about to cross the Drake again in the other direction--a 10 October ScienceInsider report and an 11 October E&E Publishing/ Climatewire article. As for the view from the contractor employee side of things, check out the recent blog entries from this UT friend who would have been one of the caretakers. 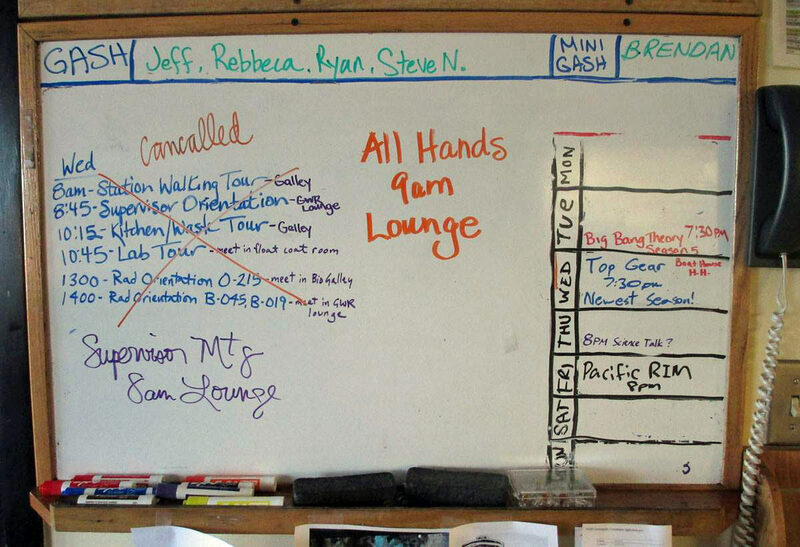 The photo at above left of the LMG upon arrival is from his 9 October blog post...at right is the ominous 9 October posting on the Palmer whiteboard. 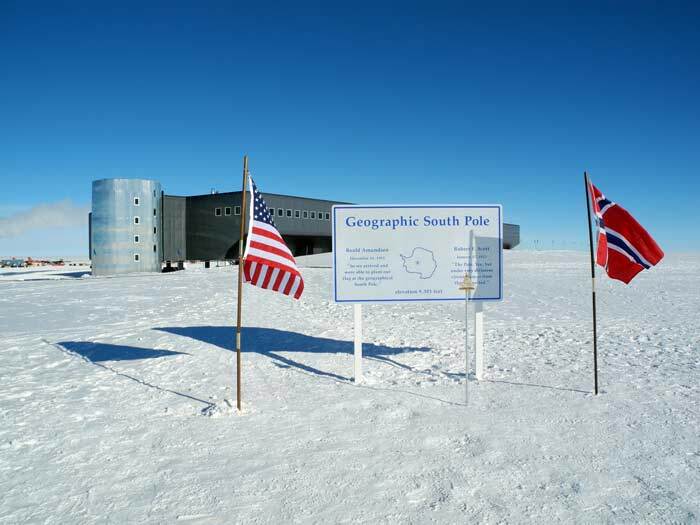 For the Pole and McMurdo side, "it's complicated" as all future science was cancelled. There actually little impact on Pole, as (despite the early opening flight at the beginning of October) it is still technically in "winter" status. Here are a few more news links--a 11 October Huffington Post article "An Unprecedented Antarctic Disaster, Unfolding in Darkness", another 11 October Wired Science article "Why Shutting Down U.S. Antarctic Research Will Have Global Repercussions", an 8 October Yahoo News article "Shutdown Cancels Entire US Antarctic Program", a 10 October New Zealand Herald article "NZ scientists take over Antarctic Research"describing how the Kiwis will take over some of the USAP research efforts, and a 9 October Boulder Daily Camera article about the shutdown impact on University of Colorado researchers. All of these articles primarily address the science projects...but the impact on the support contractor people is significant as well. Unlike the last significant U.S. government shutdown in December 1995-January 1996, this one occurs at the very beginning of the austral summer season as people are deploying. On Tuesday 8 October as the shutdown was announced, many newly hired contractor folks were heading south. When they got to Los Angeles, instead of flying onward to New Zealand, many of them were stopped, given a hotel room for the night, and sent back home the next day. And a day or two later, many of the new McMurdo arrivals were being sent back north as well. Keep in mind that these people had accepted employment for 4-12 months in Antarctica and accordingly had given up leases, sold cars, and otherwise abandoned their American residences...assuming they'd be gainfully employed on the ice to support themselves and their families. A support group was also set up. The news stories mostly address the science impact, as I've said already. But there is personal impact as well. Several people, including a good friend, articulated their feelings about this debacle in early October. Many of these comments are longer online, but they are mentioned on Fox News. People on the ice were told that their jobs would end and that they would fly north in the next few days...but the long list of northbound passengers (as well as flight delays due to poor weather) meant that many employees were still on the ice after the government shutdown ended, and their jobs would now continue. Here's another post from an unidentified McMurdo worker which appeared on Gawker the day before the shutdown ended. There still had to be a major fuel resupply to Pole, via the traverse as well as NYANG LC-130 flights. There were no plans for the station to be shut down...there's too much electronics in the infrastructure to allow the place to go cold. IceCube data taking was continuing, and there should now be little impact on that project. Remember that it and other dark sector projects are big power users requiring more fuel for the power plant. Most significantly regarding resupply, there were discussions about cancelling the cargo vessel, and the McMurdo population, instead of rising to a summer peak, was go from 500 at present to about 100 by the end of the summer season. Specific staffing plans for Pole and McM were being cussed and discussed. Late in the evening of 16 October, Congress passed a continuing funding resolution lasting until early February. It was signed by President Obama shortly after midnight on 17 November--only a few hours before the Laurence M. Gould was scheduled to head north from Palmer Station with all of the summer scientists and their equipment. 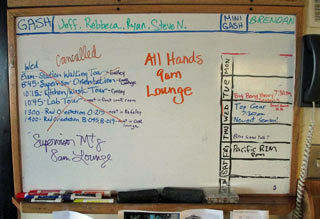 With the restart, all of the hastily made USAP plans were being frantically reworked again. Here is a 7 November 2013 White House blog post addressing the impacts and costs of the government shutdown. It includes a link to the detailed report, which states, "For example, NASA and NSF had to cancel their Antarctic-launched long-duration space science research missions for the year because NSF cannot reopen facilities in time to get research balloons off on schedule. 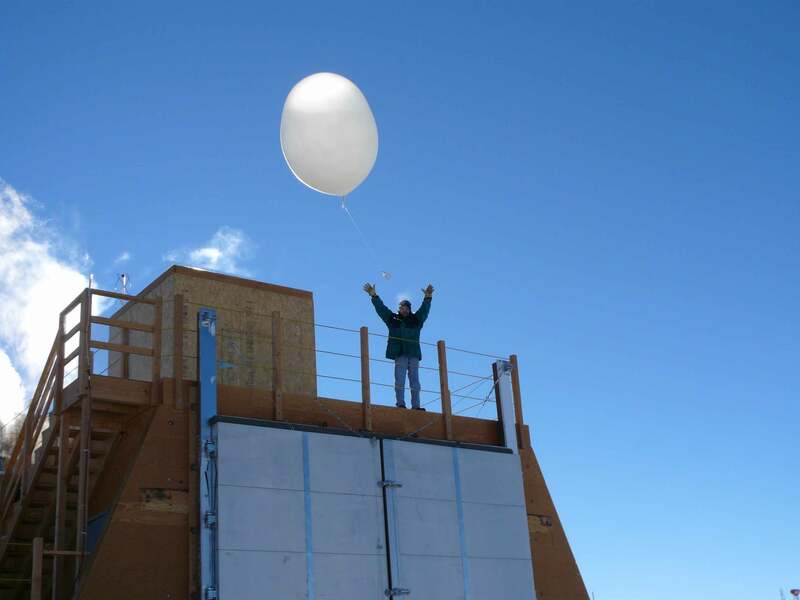 The balloons are used as a platform for space science research into phenomenon such as cosmic rays and the Big Bang."